OSAGE COUNTY, Okla. -- With the spring season in full swing, firefighters are starting to see wildfires pop up around Green Country. Many departments use strategic methods to stop the fires before they get out of control. "We’re just burning out 1803 back to the main fire where we left off last night," said Ross Walker, Department Director, Fire Management Officer of Osage Nation. 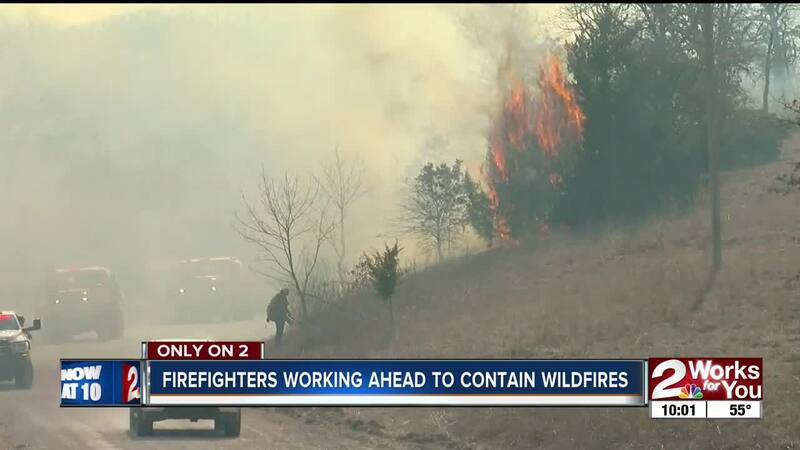 Firefighters say it's not March in Oklahoma without wildfires. Nearly 2,500 acres are burned to a crisp in Osage County from a massive wildfire that sparked on Tuesday. Around 50 firefighters, including volunteers, spent more than 12 hours straight on Tuesday trying to contain the fire north of Cleveland. "No homes were lost or damaged and now the homes are secured," Walker said. Even though the area received rain overnight, the fire sparked back up Wednesday. The firefighters are using techniques to get ahead of the flames. "Once we burn this fuel when the main fire hits the burnt fuel there’s nothing left to consume so it puts itself out," Walker said. To stop wildfires, they use techniques like backfiring, where they ignite a line of fire to stop the main one, but they say they try not to use it too often. "We’re in the business of putting fire out not lighting fire," Walker said. Another proactive technique to stop a fire is called burning out, where they remove fuel between the containment line and main body of fire. "They’re cutting the cedars which are highly volatile, I mean the fire gets underneath them they flare out, torch out," Walker said. Firefighters say homeowners can help them out by reducing the amount of debris around their house and keeping their grass cut short.